This is a tasty one pot meal perfect for a filling yet lazy breakfast or lunch option. If you don't have cooked rice, cook rice and keep aside to cool. Now take oil in a kadhai and heat it. Add mustard seeds, cumin seeds and gram dal and fry till they all sputter. Now add the chopped onions and fry till translucent. Add the ginger paste and slit chillies. Mix well and fry for about 3-4 minutes. Now add the finely chopped tomatoes or puree. Add turmeric powder, coriander powder, chilli powder, sambar powder and salt. Cook well till the tomatoes are well cooked and the paste looks darker and releases oil. Now turn off the gas and add the cooked rice. Mix well so that all the rice is covered with the tomato paste. Taste and adjust seasoning especially salt and heat. Serve hot with raita or a boiled egg. Delicious to eat. You can adjust how many chillies or chilli powder you wish to use depending upon taste. I prefer to use the local sona masoori rice while making it but you can use basmati as well. Make sure the rice is not mushy or else your tomato rice will be a mushy mess. Do try this easy recipe. 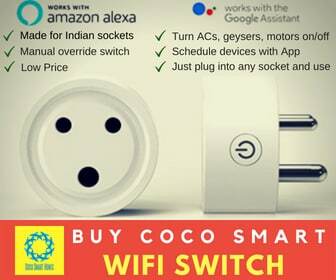 I am sure that it will become regular fare in your home. Have it with raita or egg for a balanced meal. Do try and let me know how you liked it. Beautiful rice! 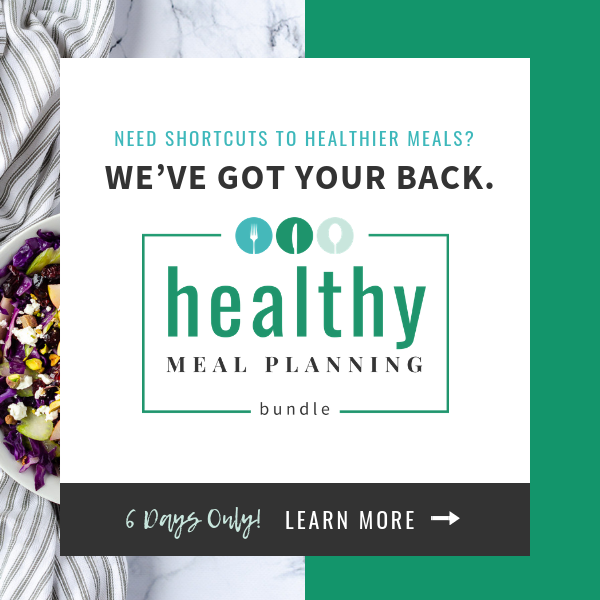 Perfect for lunch box!! Thank you so much, Megala. It is! Yum, yum. Have tried curd rice, puliogare rice, lemon rice. 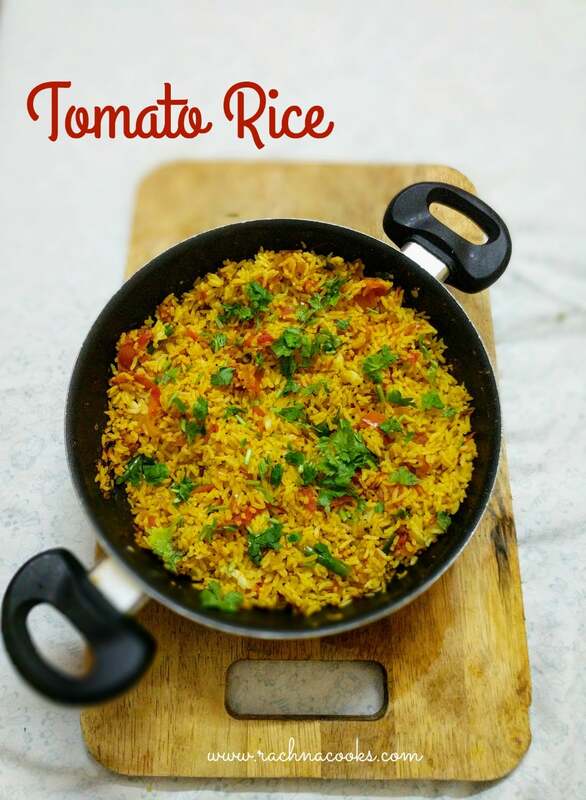 Now time to give tomato rice a go and I’m sure it will be lip-smackingly delish, after all your recipe Rachna. ? Thank you, Nats. You really should try this one! 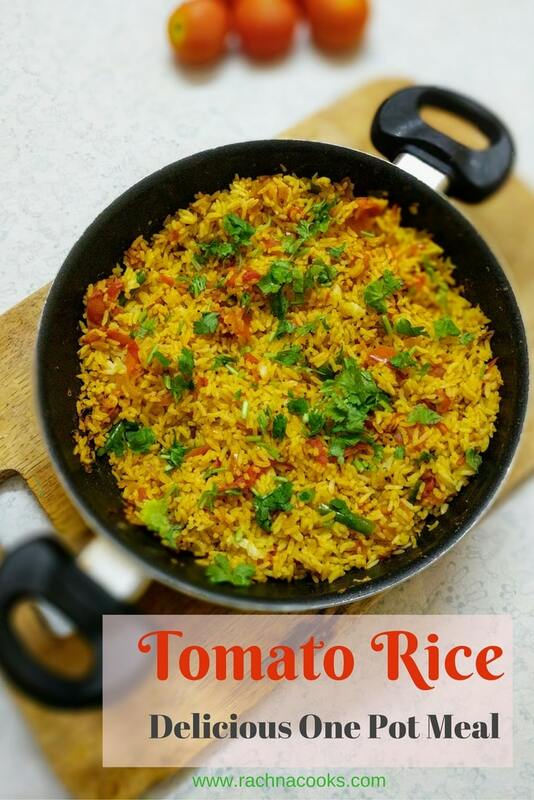 Tomato rice is a favorite go-to for me. I always have the tomato “gotsu” prepared and ready, to mix with rice, to eat as side-dish with rotis, as a sandwich spread…. the possibilities are endless. We have a friend who loves to side-dish it with dosa. Sometimes I add a stick of cinnamon to it and it tastes great. Nice! I make it with garam masala instead of sambar powder, but otherwise, the same recipe! Looks delicious! I alternate between the two depending upon what is available. 😉 It is actually so tasty and simple. I have wholeheartedly adopted it. Looks absolutely delightful! My mom makes a fab version of this ? I usually make coconut rice or puliogare. Should make this for dabba. Thanks for the idea, Rachna ? I am sure. Mums are so good with cooking. 🙂 You really must try this. My kids just love it in their dabba. The tomato rice looks tasty in the photo. This recipe is doable for me. I will try it over the weekend. You will like it, Anamika. It is really so simple. Let me know if you try it how it went. I made the tomato rice for lunch today. It turned out tasty. D also liked it very much. So happy to hear. ? We make this with left over rice too and it is loved by all of us. Sambhar masala gives it a distinct flavour! I loveeeee tomato rice… With lots of peanuts. It is my go to recipe too. I haven’t made it with dal though. Will try it next time. Oh with peanuts. Never heard of that. Erm dal? I don’t use dal either. 🙂 But you must try it. It’s a really nice recipe. Perfect lunch box idea this is. My mom is to send it to me once in a while. While my husband hates the flavor of tomato, I don’t make this often. Though sometimes I add methi leaves to this and call it methi rice for him ?